Today we peer into the often unseen Asawindum Muay Thai camp. It’s very rare that one gets a chance to look into the inner workings of this famous camp. So rare is this opportunity some foreigners even believed the gym was closed. In fact the gym is still open and operating and in Bangkok but difficult to find and not easily accessible by bus. Asawindum’s oldest and most famous fighter is “Burlek Pinsinchaï” ( Thailand Champion 1983 and 1984, Lumpinee Champion 1986 and 1987) who runs his own camp in the Lampang region (North), The Burlek Gym. The other big name from Asawindum is Thailand Pinsinchaï (3 times Lumpinee Champion, Radjadmanen Champion and Thailand Champion) who is now retired from fighting. Asawindum has also trained notable international boxers in Maxsaisai Pinsinchai and Petchtapee Pinsinchai. It’s not been open in the past to foreign visitors so this camp tour coincides with the newly open policy allowing foreigners to train there. This marks a pretty historic move and of course allows unprecedented access into Asawindum. With an insider’s perspective, Saul Khan provides an inside look and an overview of some of the training. Much thanks to Saul Khan for the photos and information! Because of the secrecy surrounding the camp, not many people have ever seen Asawindum only the fighters when they arrive in the ring. Due to the quality of the fighters people believe all sorts of things about the gym: that it’s a high tech training facility replete with specialized equipment and doctors of all varieties run tests and the boxers are covered in diagnostic equipment. I’ve heard people say these things but having experienced it, the gym is completely different to imagining it. It turns out high tech equipment doesn’t make fighters, having the latest and greatest medical and sporting advice on hand doesn’t make great fighters. Asawindum gym believes you’ll only make it with a lot of blood and sweat! I’ll be the first to tell you that this gym is old school Muay Thai with a sweat soaked and stained ring for wrestling and sparring, and 7 sandbags, which have been sewed and resewed so many times they look like patchwork. There are 2 old weight machines which are barely used, 2 sets of dumbbells and one bar. You can lift yourself onto the ceiling supports for doing chin ups. Don’t expect a soft padded floor. Here you train on the concrete. There’s no running machine at Asawindum, we run on the concrete floor. There is no air conditioning and training stops for nothing in the heat. Training is 366 days a year: Christmas there is training, New Year’s day there is training. Every day the boys are building themselves for fighting. This is essentially all you need to make the best Muay Thai fighters in the world, that and some lessons in real Muay Thai. Training is extremely hard here and it is usually for 6 or more hours a day, 7 days a week. At Asawindum the boxers put hours and hours into every technique. The basics are used each and every day so you are always prepared. At Asawindum the Pinsinchais teach extremely devastating advanced Muay Thai. Once all the basics are locked down you can begin learning how to use advanced Muay Thai skills to really damage opponents. 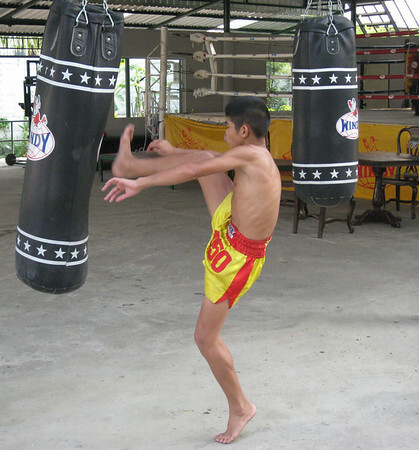 Pinsinchai trains specifically to bypass a boxer’s guard. There’s a way around a boxer’s defense to kick him in the head. At Pinsinchai they also focus on getting past the closer range to attack with hands and elbows. The training is in short grueling but with definite rewards. I have to emphasize this is not a gym for training casual enthusiasts or hobbyists. The regimen is hard and rough. Egos are not advised at Asawindum and invariably egos are trimmed with quick reality checks that comes from hard training. If you can live without amenities and ready comforts you can learn real Muay Thai. There are cooks on site and a staff of people who keep the gym clean. 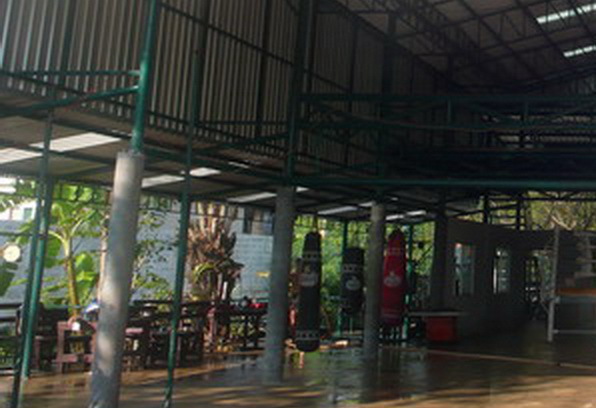 Pinsinchai/Asawindum gym has always been an extremely closed society. In the past Asawindum only opened to elite fighters who receive a recommendation to join the gym. Asking to join the gym would have been an extremely embarrassing experience as there was a high chance of being turned away. Now though Pinsinchai/Asawindum is opening to all people to do the same workout as the real Thai champions. Here you’ll be taught to fight like real Thai champions and to build that relentless spirit that comes from training with the best in the business. ~ by fatsoking on April 7, 2010.